The practice of care management is central to the implementation of the 1990s community care policy. 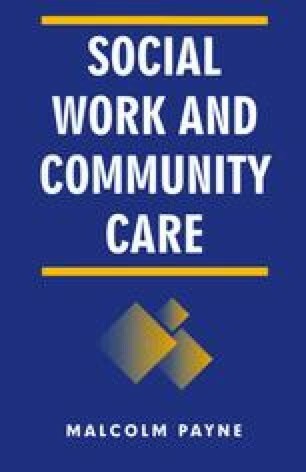 The purpose of this chapter is to examine the ideas contained in ‘care management’ to see how these are being implemented in community care practice and to relate care management to social work practice. Two main approaches to care management exist. One is the ‘social care entrepreneurship’ approach developed from American ‘case management’ and introduced into the UK primarily through the influence of the Kent Community Care Project. Since this was the model adopted by the DoH in its guidance, it is the primary focus of this chapter. The second is the ‘service brokerage’ approach, developed from Canadian models, and used in the UK in more multi-disciplinary, user-oriented projects. These focus on getting co-operation between services and encouraging service users to plan and make their own demands. Doria Pilling (1992) has developed a further distinction between service brokerage and multi-disciplinary care management; this latter form focuses on organising a multi-disciplinary team, particularly using a ‘keyworker’. This is introduced in the latter part of this chapter to offer comparisons with the model adopted by the DoH, and features of care management relevant to both models are explored.